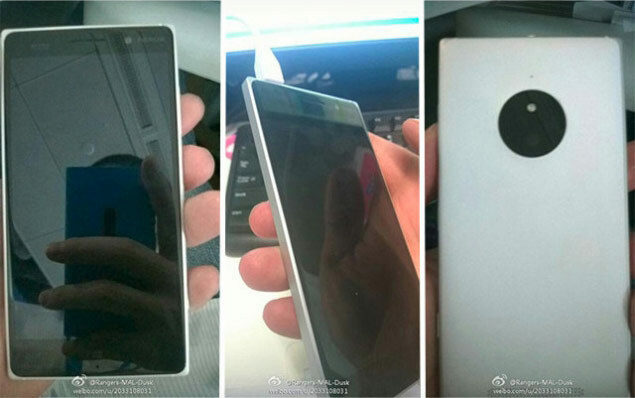 Earlier today, popular Chinese social network website Weibo released a few pictures of an upcoming new Lumia device. The rumor mill is claiming that the device is the Lumia 830. As its moniker ‘830’ suggests, the Lumia 830 will succeed the ageing Lumia 820, which has been around for most part of two years, and desperately longed for a successor. Although the pictures are quite blurry, but a quick look shows that the handset in question boasts an aluminum frame, much like Lumia 925 and 930 and a polycarbonate design. The phone is a move away from the boxy design of its predecessor, and looks much better as well. The specs of the device are unknown but by the looks of it one can at-least expect a monetary upgrade of hardware over the Lumia 820. Despite Windows Phone 8.1’s support for on-screen navigation buttons, the phone is likely to retain the capacitive touch keys. It will be one of the very first phones that will be released under Nokia after the total acquisition of the company by Microsoft. So it is yet to be seen how Microsoft will incorporate it’s own ideas into the device. Although a specs update is most likely in tow, the purported Lumia 830 will still be a mid-range device. Also, Microsoft’s current plans include three new devices based on the latest Windows Phone 8.1 update. Device codenamed ‘McLaren’ is a flagship-esque smartphone with 3D features rivaling that of Amazon’s new Fire Phone. ‘Superman’ is 4.7-inch mid-range handset, while ‘Rock’ will be a low-end Windows Phone, most likely a Lumka 520 successor. Before you start wondering, the Lumia 830 is neither of these devices mentioned. The pictures could very well be fake, so take this bit with a pinch of salt, but Weibo did leak pictures of other Nokia devices like the Nokia X, Nokia Lumia 1520 and the Nokia Lumia 719, all of which ended being legit.